ADDIS ABABA, Ethiopia (AP) — Ethiopia's leader on Thursday urged the international community to donate more toward emergency food aid for millions of people amid a drought. 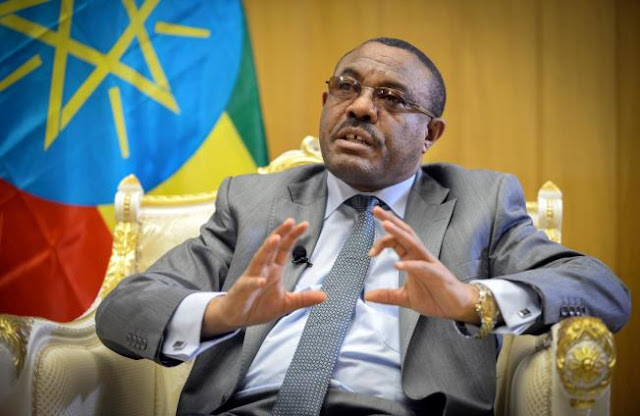 Ethiopia "should not be neglected by any means despite all the other crises that are going on elsewhere in the world," Prime Minister Hailemariam Desalegn told The Associated Press in an interview. "My country deserves more support because we are also sheltering some 750,000 refugees from neighboring countries that need food aid," he said. "If something goes wrong, it is the international community who has not come in. The aid provided to us so far is very little and it often came very late. I urge organizations like UNICEF to come in if they think this is a worst case scenario. Just talking is not a solution." Aid agencies and the Ethiopian government say more than 10 million Ethiopians need urgent food aid and more than $1.4 billion is needed to deal with the crisis, with only half of that secured so far. The U.S. has been the biggest donor, giving more than $532 million in humanitarian assistance to Ethiopia since October 2014. The Ethiopian government has also spent about $380 million of its own money. The drought was brought on by the El Nino climate phenomenon that affected seasonal rains, causing crops to fail and killing livestock. Ethiopia was devastated by a drought in the 1980s exacerbated by a civil war that killed hundreds of thousands.